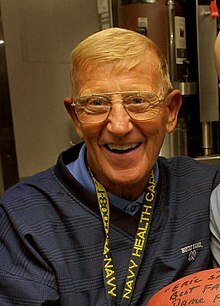 Lou Holtz (born January 6, 1937, in Follansbee, West Virginia) is a former NCAA football head coach, and is currently an author and a motivational speaker who has spoken to the likes of Fortune 500 companies on topics such as the importance of teamwork and goal setting. The next flag they plant will be all white, and it'll be surrender. Ya know, Hitler was a great leader, too. He had shoulder surgery on his elbow. Attributed by Ben Weiximann, "Top 15 Funniest Lou Holtz Quotes", TheBleacherReport.com. Also see "Say What??? ESPN Broadcaster... a little confused...". Attributed by Ben Weiximann, "Top 15 Funniest Lou Holtz Quotes", TheBleacherReport.com.